This year we took a new approach to the traditional real Christmas tree, which hasn’t fared well in recent years, up against Tiree’s famous strong winds! We enlisted the help and expertise of Cameron Smith who came up with the idea of building a structure from scratch! Cameron spent a great deal of time investigating a stru cture that would withstand a Tiree gale and created a spectacular steel structure. 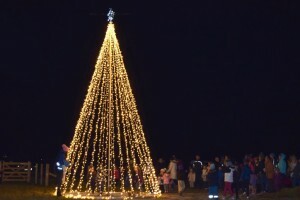 Attached to the structure which stands at 8 meters high with a lot of twinkling LED lights which creates a spectacular illusion of a tree, topped with an equally bright star! The structure looks fantastic and can be seen from some distance! he official count down took place, without a hitch and then everyone got involved by singing Jingle Bells. The sound of the singing and the glow from the tree beckoned a very special guest, in the form of Santa who arrived in style in a lit-up vehicle, with a sack full of chocolate treats for the children. lit up over the next couple of weeks. Again, we would like to say a huge thank you to Cameron Smith for creating the tree, along with Phil Knowles who donated the middle steel beam and George Bruce who helped to put up the lights. Also to Tiree Tots for being involved in organising the event and TCB for allowing the tree to be displayed in their grounds. Thanks again to all who attended the event.